Used Kids: 1980 N. High St. 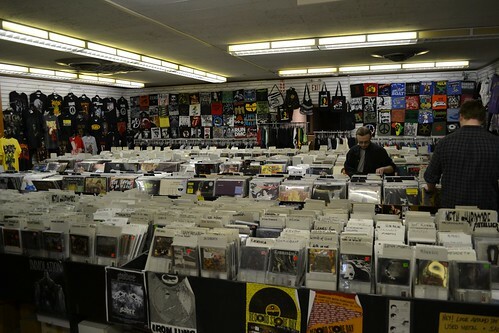 I could spend hours flipping through the massive $1 vinyl section… If you have a good eye and a lot patience you can find some used wax GEMS at Used Kids. They also have the best new releases. Back in 2010, it seemed no store in Columbus carried the Neon Indian debut LP, one day it magically appeared at this store and I snatched it up. Stop by for 20% off used vinyl every Monday. Lost Weekend : 2960 N. High St. Inside this shop, you’ll likely find owner Kyle behind the counter, cleaning vinyl and conversing with other audiophiles about the latest music news. Kyle will gladly help you track down that record you’ve been looking for, and if you’re nice, he’ll set aside vinyl he thinks you’ll dig for you to pick up next time you stop in. Lost Weekend can be easy to drive past because it’s tucked away inside a house in the Clintonville/Old North district. Just look for a cream and brown house on High Street, between Crestview and Tulane. Johnny Go’s is located in the middle of the High Street strip of OSU Campus. The shop’s owner pumps out catchy tunes through a sidewalk amp, luring passer bys into the small yet well curated store. You can even find that Beatles poster you’ve been searching for to cover the ugly walls of your dorm room. I recommend chatting up the owner, he has some great stories from back in the day. He may seem standoffish at first but he will warm up to you when he realizes you’re almost as big of a music nerd as he is. Spoonful Records: 116 E. Long St. I have yet to visit this new shop located in downtown Columbus. However, from what I’ve heard and seen pictured in our local newspapers, Spoonful Records is THE sleekest record shop in Columbus. The owners took great care to make the inside hip, friendly and cosy. I’m planning on stopping by as soon as my bank account is replenished from all the Christmas shopping because I know I’ll drop some serious dough on their record selections. Magnolia Thunderpussy: 1155 N. High St.
What Magnolia Thunderpussy lacks in atmosphere, they make up for in merchandise. This is your one-stop-shop for band t-shirts, cds, vinyl, and tickets to some of the best shows in Columbus. They’re also located right next door to the legendary Skully’s Music Diner, home to many a drunken night of musical fun. Newer PostHave you hosted a touring band at your home?